What have they been doing the last 30 years? Why are our networks still not fully automated after all this time? 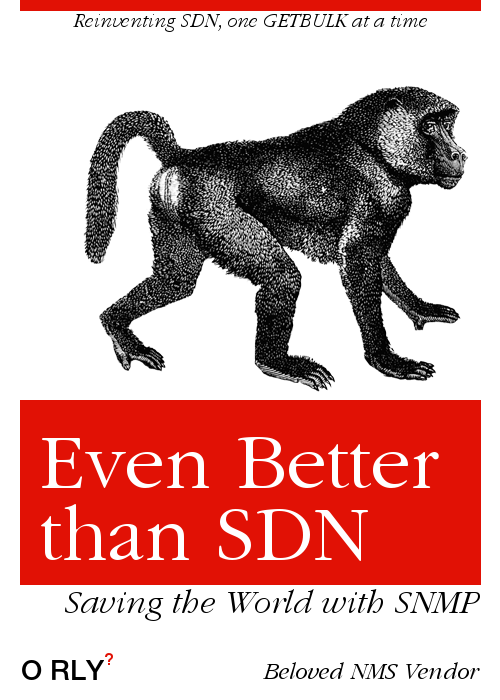 What is all this SDN brouhaha about if they already solved the problem with SNMP? Q: "Why are our networks still not fully automated after all this time?" A: For most people "not in IT business" the "call a contractor to do it" is pretty much the equivalent of automation. Besides, you can yell "just make the damn thing work" to a human contractor, but not to an automation tool ! For those that do handle some IT internally (lower the use of contractors) there's the balance between getting random things done fast and working on automation, but it will need some time before that balance get to the correct point.... like the time to get rid of all "network guys" that never learned how to write a line of code - and there's armies of them. I clicked on this expecting the date tag to be April 1st. SDN architecture has different aspects and automation is just one of them. You can/could possibly perform some level of network management and automation with SNMP but how complex would that be? do all vendors support the same level of SNMP functionality? It can be. Look at the Atrinet solution. But the better to use the SNMP for FCAPS management and CLI/Netconf... for service automation. At a previous job I worked at (the IP Division of Alcatel-Lucent, now Nokia) we had a fully SNMP-based NMS for the 7x50 series IP/MPLS routers, complete with a fully functional SOAP API (it was called the 5620 SAM). It had it's quirks but to date I've never seen anything quite like it. I saw many customers who's primary interaction with their ALU IP/MPLS network was through this tool and it's API, including things like doing mass-provisioning of leased lines and subscriber profiles. The pattern I noticed however was customers would use it to automate a few specific things (i.e. provision customer circuits, run audits) but wouldn't bother with full config management and deployment of their network. I.e. they would solve their 80% and ignore the rest. Depending on the customer and their business needs it's hard to argue against that choice. So, I would argue that yes, this is possible and in some specific sectors it has produced decent automation results. But this was due to pure business need: provisioning a ton of highly repeatable services that make money quickly and accurately. Network management is the over the water part of the ice-berg in SDN. As an example, if you look at SD-WAN as one of the use cases of SDN, you will quickly realize that the intelligent management of WAN links in real-time wrt to applications flows is going way deeper than just simple network management. Yes, "automation" is still the key term here, but the granularity that automation is applied can be drastically different.